The soup bowls remain warm for a while in the guests' hands, while the soup warms their insides. One by one the candles are moved from the solitary space to the three tables of the Silent Convivium. The sound migrates from the tiny speakers to a volume of sound raining down from the roof. At the same time, a sweet, zingy scent emerges from the far corner of the room. Finally a warm yellow light illuminates the Convivium and the guests are invited to find their places at the tables. A cool lemony sorbet is served to cleanse their palate. 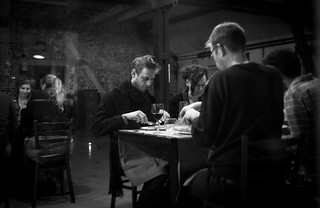 The sounds of smoking and steaming envelop the room. Glowing embers and bursting liquids, mingling with the voices from the kitchen. A beetroot wine is served. Thick and earthy, sweet and bitter. In the middle of the table the waiters place a steamed garden, complete with soil and colourful 'compost' made of steamed root vegetables, served with small shovels. The sounds weave in and out, adding timbre to the silence and short soft conversations. The garden is followed by fluffy steamed dumpling and two smoked sauces, piquant tomato and smooth cream. The flow continues with sweet basil seed water and a robust red wine, paired with wood-wrapped mushrooms and tea-steamed spinach, arriving with with potatoes wrapped in smoke. By now the silence is slowly diminishing, as the sharing of a meal cooked over fire and smoke cannot but incite conversation. 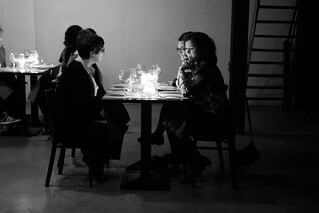 Conversations about the food – the taste, sound, experience. To awaken the palate a fresh green juice is offered just before the doors to the dessert room open. After the contemplative atmosphere of the Solitary Immersion, we diffused an uplifting fragrance in the air, literally and figuratively lightening the atmosphere. Citronella activates the senses and combats fatigue, stimulating guests to sit at the table and see each other with fresh eyes. Light one stick of Citronelle incense a few minutes before guests arrive. Sorbet is a traditional palate cleanser, as it refreshes the mouth and removes lingering flavours. It tastes clean and bright, and the cold slightly numbs the taste buds into forgetting the intensity of the previous courses. Boil the water and infuse it with the lemon balm and verbena leaves for 15 minutes till the colour becomes light brown. Strain the leaves. Let the herbal tea cool down, add honey (not above 50°C) and lemon juice. When completely cooled pour the liquid into an ice cream maker and leave it turning until the mixture thickens. Transfer to a container and place the sorbet in the freezer until needed. Serve one small scoop per person. 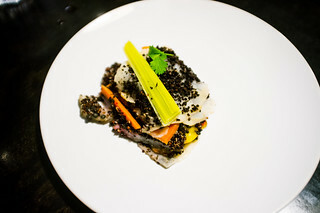 The garden was one of the most complex and playful dishes to prepare, but its taste was light and uncomplicated, accentuating the colour, deliciousness and diversity of seasonal root vegetables. Chop all root vegetables in thick slices. Divide 1/2 cauliflower in small florets. Chop one orange carrot and 1/2 beetroot in the thinnest slices on the mandoline. Steam until done (soft, but not falling apart – it will take between 15 and 30 minutes). Steam carrots and beetroot (both thick and thin slices) on red wine in a bamboo steamer. Steam leak, radishes and parsnip with rosemary oil and vanilla. Steam Jerusalem artichoke and cauliflower on milky oolong tea. Shock under icy water to prevent from overcooking. Chop or blend each vegetable in tiny chunks (1/2 cm or less). Keep in separate containers in the bain-marie. Preheat the oven to 220°C. 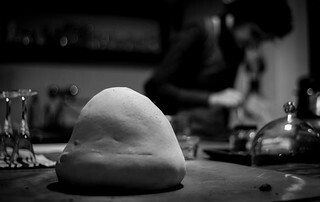 Mix the salt, flour and water into a dough, roll it out and use it to cover the celeriac (unpeeled). Bake in the oven for 20 minutes, then reduce the temperature to 160°C and cook for another 35–45 minutes, depending on the size. Leave to cool down, then store in the fridge overnight. 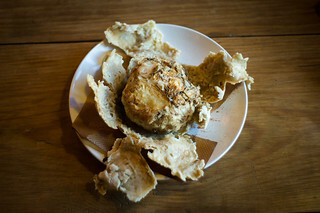 The next day, break the crust (from the bottom is the easiest), peel the celeriac and slice it thinly on the mandoline. Reserve the slices in an airtight container. For the quinoa: add one cup of water and steam (~5 minutes, 10 minutes resting). For the lentils: add 3 cups of water and boil it down until all water is absorbed (~20 minutes). Mix quinoa and lentils and add coconut oil, salt and pepper. Reserve in an airtight container and warm up in the bain-marie just before serving. Preheat oven to 180°C. Line a baking sheet with a nonstick baking mat. Mix all powdered ingredients. In a small saucepan, melt butter with truffle oil over medium heat, whisk to combine. Whisk the butter mixture into the powder; spread on prepared baking sheet and transfer to oven. Bake for 5 minutes; rotate baking sheet and bake for 5 minutes more. Remove from oven and let cool completely. Break into a wet powder with a soil-like consistency. Reserve in an airtight container. Toast apple wood chips in a pan to release the aromas and pour water over them. Infuse the mixture for 7–8 minutes (longer is OK too, it makes the taste stronger), then strain, discarding the wood. Heat the liquid and whisk in the butter to emulsify it. Keep warm in the bain-marie. Place a layer of celeriac slices on the bottom of a glass container. 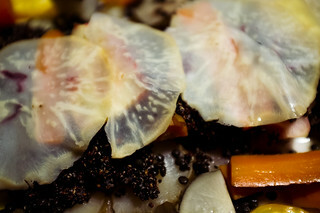 Layer each steamed root vegetable with some grit and soil, every few layers place a celeriac sediment in between. On top cover with a thicker layer of soil and decorate with cauliflower florets, sprouts and cress. This cocktail looks like a thick red wine, but tastes earthy and bittersweet. The illusion surprises the taste buds and complements the sweetness and graininess of the vegetable garden. 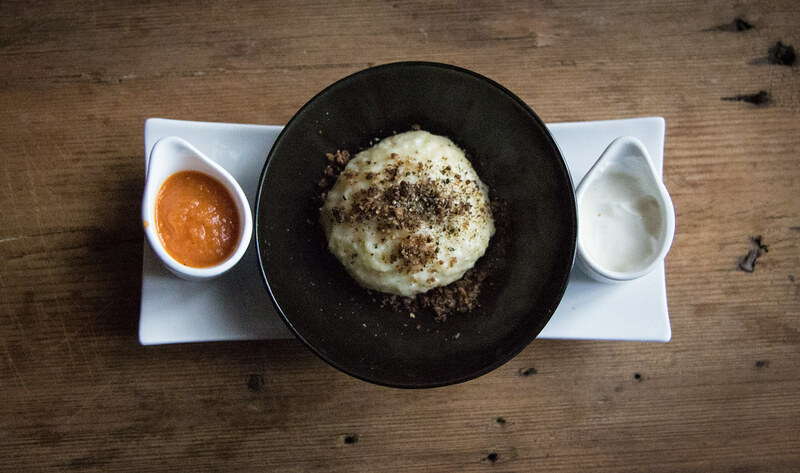 The crudeness of the traditional Balkan cheese dumpling in this dish is complemented by the smoothness and delicateness of a lightly smoked cream and the complexity of a smoked tomato sauce with a hint of the Orient. Mix all ingredients. If the mixture is too crumbly, add some of the remaining egg whites (slowly, 3 might make the mixture too liquid). Leave the dough to rest for 15–20 minutes. Steam for 10 minutes at 100°C. Dry pumpernickel bread for a couple of days, or a few hours in the oven. Break into small pieces and toast in a pan. Allow to cool. Blend the pumpernickel crumbs in the kitchen blender together with the crackers. Sieve to separate smooth from rough crumbs. Reserve separately. Just before serving, melt the butter in a frying pan and fry the bread crumbs until they become crispy. Serve with rough bread crumbs on the bottom and fine ones on top of the dumpling. On the side serve cold smoked Creme d'Isigny and warm smoked tomato jam. Smoke tomatoes, garlic and onion with smoking gun for 3 minutes or stove smoker for 20 minutes. Place in a baking tray and combine with chilli, cinnamon, orange water, and saffron. Bake in the oven at 180°C for 20–30 minutes till the skin of the tomatoes begins to peel off. Peel the tomatoes, blend with the rest of the ingredients with electric mixer. Add salt and pepper to taste. Smoke the cream in sauce containers with the smoking gun for 1–2 minutes. Keep under the bell jar for another 10 minutes. Serve cold. So far we were cautious with the amount of 'smoke' we served to guests. In this dish we let ourselves go. 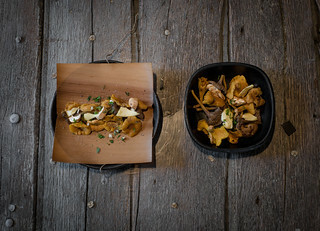 Four different types of wood and smoking techniques were used to create this dish, designed especially for smoke aficionados. Chop the herbs finely, add salt and pepper. Brush the mushrooms to remove sand and grit, marinate in the 2/3 of herb mixture. Add olive oil to the remaining herb mixture. Chop seitan in 1/2 cm small cubes and mix with the herb marinade. Marinate for a couple of hours. Soak the grill wraps and butcher's twine in a mixture of water and red wine for at least 10 minutes. Combine mushrooms and seitan. Divide them on 8 wraps. Wrap and tie with butcher's twine. Smoke in the Green Egg for 10 minutes. Place purple potatoes in a red clay baking tray, mix with coconut oil, salt, pepper and rosemary and bake/smoke in the Green Egg on low heat (160-180) for 2 hours. Marinate white potatoes in truffle oil with rosemary, thyme, salt and pepper for an hour. Place in alder bag and smoke in the oven for 1 hour. Finally, combine both potatoes on a black plate and smoke for 1 minute with the smoking gun. 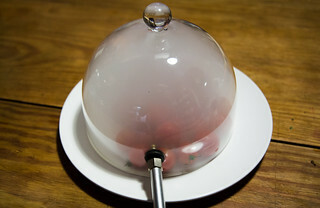 Serve under the smoking bell, with smoke still present. Remove the butter from the fridge and let it warm to room temperature. Boil the water and whisk in the butter, infuse this mixture with the spices and tea for 4 minutes, then strain. Rinse the spinach and parsley thoroughly to remove all the dirt. Steam the parsley for 1 minute in 4 tablespoons of tea emulsion. 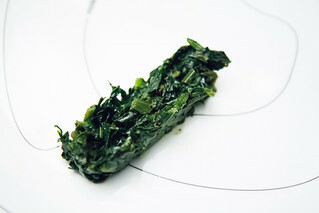 Then add the spinach and the remaining emulsion, steam for another few minutes until just wilted, and season to taste. Take the spinach out, cool it down and reduce the emulsion into a syrup, then let cool further. Add lemon juice to taste. Mix spinach and emulsion. Keep in an airtight container until serving. 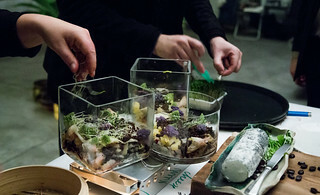 Push through a rectangular mould directly onto the plates. After so much smoke, an antioxidant palate bath was needed. We chose parsley for its garlic-neutralising power, celery for its calorie-devouring potential and an astringent apple to awaken the digestive system. 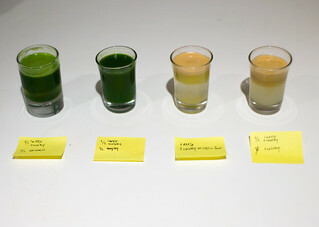 The intensely green colour of the juice was meant to refresh the eyes. Juice apples and celery, add lemon juice and mix. Juice parsley stalks. Mix 2/3 apple and celery with 1/3 parsley juice. Sieve through a coarse tea strainer. Serve in shot glasses.